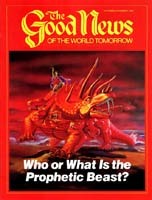 Millions are already talking about The Plain Truth, and about the strong, straight-from the-shoulder Bible articles appearing in this magazine, The Good News. Millions have read booklets and articles showing the truth about the existence of their divine heavenly Father, the Creator, who gives them every breath they draw — and they have seen the utter ludicrousness of the evolutionary fantasy and other false teachings. Many government leaders, educators, lawyers, judges, corporation executives and leading entertainment figures are numbered among those who have heard, who have read and who have wondered. God says' "So they come to you as people do, they sit before you as My people, and they hear your words, but they do not do them; for with their mouth they show much love, but their hearts pursue their own gain. Indeed you are to them as a very lovely song of one who has a pleasant voice and can play well on an instrument; for they hear your words, but they do not do them. And when this comes to pass — surely it will come — then they will know that a prophet has been among them" (Ezekiel 33:31-33). What is it going to take to make you heed and act on the knowledge you are receiving through The Plain Truth and The Good News? How much will prophesied supernatural punishment have to affect you, personally, before you are willing to change your ways and obey God? Most thinking people are convicted by what they hear over the World Tomorrow telecast and read in the pages of The Good News — they know it is right. But they resist and resent having to change their human way of life! Yet, in this age above all others, your willingness to change and accept and obey the truth God is revealing through His servants in these end times is the key to your very survival — now and forever. Before much longer you will be able to see that this is not just a sentimental idea — it is a fact. Almost as if with one voice, those faithful men of God have cried out about the national crimes and sins of their peoples not only in righteous indignation or wrath, but out of deep, personal concern. Ezekiel cried, "Why should you die, 0 house of Israel?" (Ezekiel 18:31), and Jeremiah lamented, "For He [God] does not afflict willingly, nor grieve the children of men" (Lamentations 3:33). They answered the cry of people who had myriad problems people who said, "He's only badmouthing the nation, and he never offers any solutions!" They did offer solutions vast, far-reaching solutions to world problems, and to the problems of individuals, by giving God's own answer. The answer is to repent — to be willing to change. For to repent not only means to be sorry — it means to be so sorry you are willing to quit doing that which is wrong and to turn around and go the other way. True repentance involves a real change. Soon after, Jesus began His own ministry, preaching the Gospel of the coming government or rule of God. He proclaimed: "The time is fulfilled, and the kingdom of God is at hand: repent ye, and believe the gospel" (Mark 1:14-15, Authorized Version). As the New Testament Church began, the inspired Peter set forth the way to salvation: "Repent, and let everyone of you be baptized in the name of Jesus Christ for the remission of sins; and you shall receive the gift of the Holy Spirit" (Acts 2:38). And again: "Repent ye therefore, and be converted, that your sins may be blotted out, when the times of refreshing shall come from the presence of the Lord" (Acts 3:19, AV). Do you resist having to change? Does it seem too difficult to you to change from your way of life to God's way of life? To be spiritually converted, a person must be genuinely, actively sorry and repentant for his past disobedience to the true God, and then he must change his way of life to conform to God's will. Haven't you noticed that the articles in the Good News magazine constantly show you habits, customs and beliefs of this world that are contrary to the commands of God? What about the days you should keep holy? What about the reward — the true goal — of the Christian? What about the constant exhortations to obey the commandments of God — all of them? What about the instructions on how to live by every word of God? "I greatly appreciate the literature you have sent me for the past two years. I have learned a lot of things and perhaps I have come close to giving my whole self to God. It's too bad that I fell short. Since I am going to Oklahoma State University this fall, I think that your material that you have been sending me would go to waste. I can plainly see that the materialistic pull and social influence — especially my roommates' — would cause me to put it aside. As you may probably see, I am not too worried about God's wrath. I put the matter aside and think, God will pull me through sooner or later. "At least I know where to run when the times get bad. That is almost like getting something for nothing, isn't it? I have no excuse. I have seen the truth and ignored it. At least you won't find me in a campus demonstration. I'm not disenchanted and looking for an answer to man's ills. I have found the answer through your work. I'm not confused. I'm just sinful. It's a pity that your literature had to be wasted. I am just a typical human." God is here describing the kind of nature you have! You don't like to change. You don't like to have to admit that your religion or your ways may have been wrong. "We like to continue to believe what we have been accustomed to accept as true, and the resentment aroused when doubt is cast upon any of our assumptions leads us to seek every manner of excuse for clinging to it. The result is that most of our so-called reasoning consists in finding arguments for going on believing as we already do." God has shown millions of you that this is His work — that Herbert W. Armstrong is His true minister. Over the World Tomorrow telecast and in the pages of The Good News, you are constantly challenged in plain, clear terms to obey the Ten Commandments literally as God intended, to keep His days holy, to come out of this world's numerous pagan religious observances, customs and traditions. But many of you just sit back and listen and say, "Well, I agree with Mr. Armstrong, but I don't see that there is anything I need to do about it." But God says, "For not the hearers of the law are just in the sight of God, but the doers of the law will be justified" (Romans 2:13). Again, God says, "Therefore, to him who knows to do good and does not do it, to him it is sin" (James 4:17). What we teach stands proved. But simply knowing these things will do you or your loved ones no good. You must act on the truth. In the main, you regular readers of The Good News really know what it is that you should be doing. You know that you should begin acting on the vital knowledge you learn through God's work. You know that even more precious knowledge of God's truth is available by studying the amazing free booklets we offer on many subjects. You know that you can be fed even more of these important spiritual truths by taking and acting on the Ambassador College Bible Correspondence Course. How are you going to feel when things you've been reading about all along suddenly come to fruition in front of your very eyes? How are you going to feel when you have known about these things all the time — have known that you ought to begin to obey God and act on this knowledge He was freely revealing to you — but have just sluggishly or stubbornly refused to change your ways and come under His protection in time? Are you going to react like the fellow who wrote us this letter? "I'm not a Christian. It takes a man to be one of them. I don't pray. I never prayed in my life. I had a chance to join a church but the way they put it across didn't seem right to me. I had a good chance to go the way of evolution but it didn't seem right. "When the truth did come along I wasn't so dumb that I didn't recognize it. I help support this work financially because I believe in it 100 percent. But, please don't think that I pray. I can't humble myself enough."